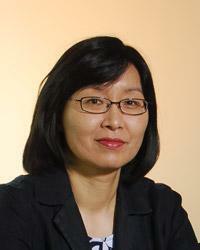 Dr. Haesun Park is a professor in the School of Computational Science and Engineering, Georgia Institute of Technology, Atlanta, Georgia, U.S.A. She was elected as a SIAM Fellow in 2013 and IEEE Fellow in 2016 for her outstanding contributions in numerical computing, data analysis, and visual analytics. She was the Executive Director of Center for Data Analytics 2013-2015 and was the director of the NSF/DHS FODAVA-Lead (Foundations of Data and Visual Analytics) Center 2008-2014. She has published extensively in the areas of numerical computing, large-scale data analysis, visual analytics, text mining, and parallel computing. She was the conference co-chair for SIAM International Conference on Data Mining in 2008 and 2009 and an editorial board member of the leading journals in computational science and engineering such as IEEE Transactions on Pattern Analysis and Machine Intelligence, SIAM Journal on Matrix Analysis and Applications, and SIAM Journal on Scientific Computing. She was the plenary keynote speaker at major international conferences including SIAM Conference on Applied Linear Algebra in 1997 and 2015, and SIAM International Conference on Data Mining in 2011. Before joining Georgia Tech, she was a professor in Department of Computer Science and Engineering, University of Minnesota, Twin Cities 1987- 2005 and a program director in the Computing and Communication Foundations Division at the National Science Foundation, Arlington, VA, U.S.A., 2003 - 2005. She received a Ph.D. and an M.S. in Computer Science from Cornell University, Ithaca, NY in 1987 and 1985, respectively, and a B.S. in Mathematics from Seoul National University, Seoul, Korea in 1981 with the Presidential Medal for the top graduate.